Discover top Romanian attractions and the unspoilt beauty of Transylvania in 2 days, with your personal guide and in the comfort of a private car. We visit two of the world’s most beautiful castles before traveling to the heart of Transylvania, a land of cultural richness and natural beauty. The tour features the medieval citadel of Sighisoara, a UNESCO World Heritage Site. Scroll down for the full description. Sighisoara – a romantic medieval citadel town with narrow cobbled lanes and colorful ancient houses, listed as a UNESCO World Heritage Site. After breakfast, tour of the citadel town of Sighisoara. Enjoy the cobbled streets and the stories of the place, and climb the steps of the Clock Tower for fantastic views over the city and surrounding area. Then, we set out to Brasov. 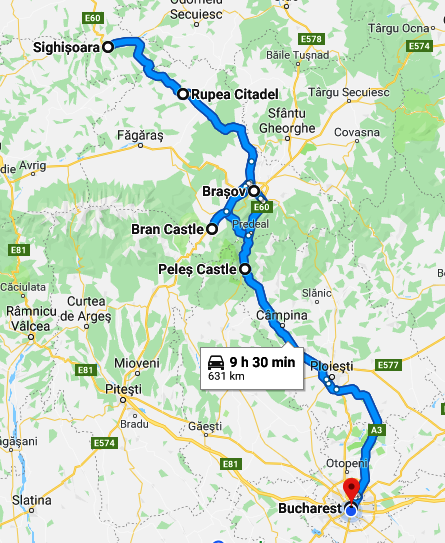 En route, see a couple of the characteristic Saxon Fortified Churches and visit the medieval peasant citadel of Rupea, one of the most representative of its type in Transylvania.